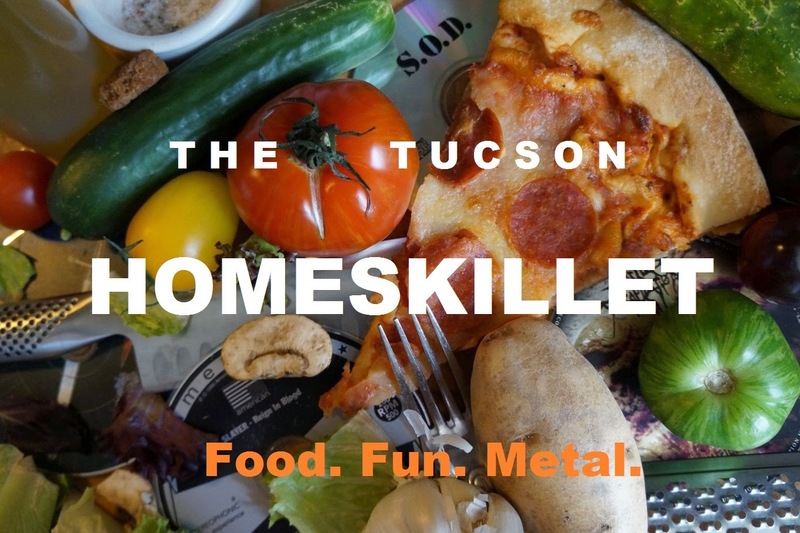 The Tucson Homeskillet: No real Southern inspired BBQ in Tucson you say? Forget that...Mr. Cookmans is here to the rescue! No real Southern inspired BBQ in Tucson you say? Forget that...Mr. Cookmans is here to the rescue! When I first moved to Tucson over ten years ago, for some reason I thought I was relocating to a bar-be-que mecca. It's the Southwest thing I suppose; me being a Northern California kid I just had this image of steaks and ribs being turned and burned over wild fire spits, their juices running, hissing as they touch down on the coals with slathered wet rubbed skins crisping as the pit master perfectly angling them on the grill sending a quick flame up from the oak and mesquite wood smoldering below. Yeah, what I got was...not really that. Okay, I was lucky enough to find some outposts most would deem "dive bars" that know how to cook a good slab of meat, the occasional BBQ joint that served up some authentic fare but then they would go out of business and then the chain places everyone seems to like/accept that, in my humble 'que opinion, were not even close to the previously mentioned idealistic vision I had splayed in my wet and/or dry rubbed deprived mind. The seemingly one game in town, that for some reason always wins best BBQ in Tucson (which I wont mention here by name), is a constant disappointment, along with being really over priced. So what's a big BBQ fan living in the Old Pueblo supposed to do? Because of my constant disappointment, one morning I went out and bought us a way-too-big-for-our-patio grill/smoker and we just did it ourselves. But...it wasn't the same. Our grilling was good but not like the miracles I have had in Texas or the deep south or a small place in some ramshackle strip mall just off Cienega Blvd. in Los Angeles, owned and operated by some southern transplants that brought ma and pa's secret chicken rub to the big city, a recipe that's been handed down from generation to generation. THAT is the kind of BBQ realness we have been craving. So when I heard about a food truck going by the name of Mr. Cookman's, claiming to offer up "real New Orleans style BBQ" I just had to find out for myself if this outfit was the actual deal. Yes. Yes, this is the BBQ I have been looking for. All I could say at that point, after much 'que carnage, was "Thank you Mr. Cookman's. You my only friend..."
Mr. Cookman's is owned and operated by a New Orleans, LA native Jonathan Hebert who runs the bright orange truck only on weekends since he has so much going on outside of cooking and keeping the lights on. "I'm actually in school right now working on a Ph.D in Business Administration," he informs as the works the line in his truck and the hungry line forming outside. "In fact, I'm actually an Electrical Engineer, which brought me to Tucson in the first place back in 2007 working for a defense company. I'm more on the management side now but I still have a passion for the technical aspects as well." With that knowledge thrown at me I had to know how it came about for him owning a food truck. "It's crazy", he mentions with a grin. 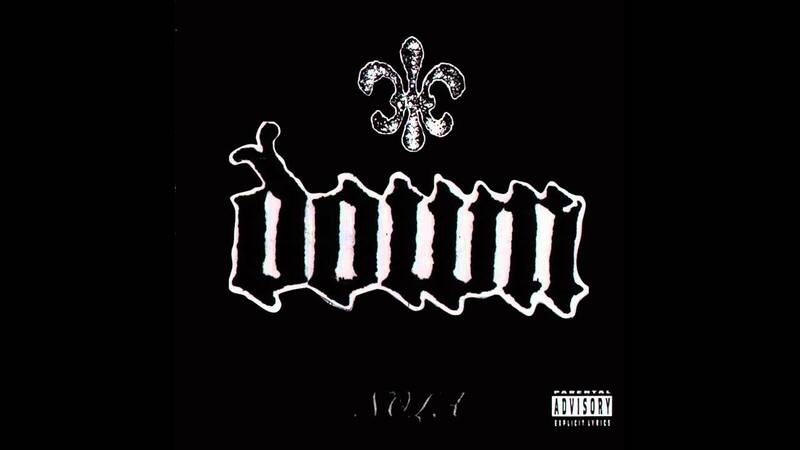 "I was attending a conference for a fraternity in Baton Rouge and some friends and I were discussing business moves and such. I told them I saw this guy selling food out of a truck in Tucson and thought that would be a good idea. The next day we see this old grill in a field of grass, all rusty and huge, and thought it was funny because we were just talking about starting a food business. Around this time my fraternity was hosting a large block party in downtown Baton Rouge serving all kinds of food for the people. On our way to the party my friend just slams on the brakes of his car because the car in front of him, that we were following to the party, did the same. Turns out there was this old van parked in a field next to a barber shop and my friend says 'Y'all have to try this man's food'. "There was this guy next to the van selling food plates. I bought a plate and I said to myself as I'm eating this man's food it was no coincidence that I would start selling food myself. Two weeks later I sold my first two lunch plates to some friends outside of the Tucson mall. At first I sold food out of my old Cadillac but business started to grow so I had to buy a truck. The rest is history!" Now that Jonathan had the truck, he now had to come up with a name for his new and expanding business. "I was doing a Vlog for one of my social media sites at the time to let them know I was selling food," Hebert explains on the origin of Mr. Cookman's. "I was just saying stuff off the cuff and out came Mr. Cookman's. The name has been with me ever since and I'm always surprised at how many people address me as such when I'm out in public." Busy with school, busy with life and now busy with the truck, I asked what a typical day for him looks like. "I'm usually up at 6am," says Jonathan lifting ribs out of the warmer. "I check emails, my calendar, social media and then I'm off. After work I usually write a few pages of dissertation for school and I'm hopefully asleep by midnight or even 1am. Food selling days, I am only focused on the business. Once I'm dressed I hit my commissary to start cooking. I load the truck and head out to the site and start setting up. "This is when I am in 'my space'; every problem in the world disappears when I am selling food. Time dissolves, nothing distracts me - just me, my food and my customers. I am so blessed that I always sell out." "Mr. Cookman's was not my first business," he mentions with a bit of a sly smile. "I guess you could say I've always had that "hustler" spirit since I was young. Believe it or not I have about two decades worth of selling things and I'm only 34 now. "In grade school and high school I always sold snacks to my fellow classmates. If I needed something I worked hard and saved to get it. In college I used my experience of selling snack foods into selling computers. Now I'm back to selling food. "I guess I've come full circle." Here's the thing: outside of all the 'business' aspects, the 'hustling' and selling, Jonathan knows how to cook food. Like I said earlier, his BBQ was some of the best I have had anywhere. So he had to have gotten those skills somehow. "I think it grew out of being in the Boy Scouts," Jonathan muses with a grin about what got him into cooking. "We were on a camping trip and we all cooked this simple dish, 'chicken in foil', which was seasoned chicken, with onions, wrapped in foil and cooked over hot coals. For some reason that flavor always stuck with me. I tried to do it in the oven years later but it just wasn't the same. I realized that it was the coals that gave it all the flavor. Since then I have been a fan of anything BBQ related. And I watch a lot of cooking shows." It seems that Jonathan and I have a lot in common: we obsess over real BBQ and watch way too much Food Network. We chatted about some of the BBQ cook-off shows that we both love and I had to ask what makes New Orleans style BBQ its own trait and technique? The snap and texture on these things was insane! "To me," he says gesticulating wildly over a grill sizzling with sausages, "New Orleans style can be described the same way you describe New Orleans food in general - savory, spicy with a hint of Creole and Cajun flavor. The key to New Orleans style cooking is the use of cayenne pepper, Louisiana sugar cane, and a special blend of hardwoods which I use to for infusing smoke flavor into the meats." Amen to that my man! Now flushed with knowledge of Louisiana style BBQ, I had to ask what he considers his signature dish. "Oh man, it's hard to pick out a signature dish," Jonathan admits as he rubs his gloved hands together. "I must say it's got to be my best seller which is the pulled pork sliders. However the ribs and fried chicken do have a cult following. Honestly I treat every dish like a signature dish. If it does not pass my taste buds," he proudly proclaims, "the public will not see it!" Having tried all of the above, yes, it would be difficult to pin down a signature dish from this man. All of them distinct, all of them tasty and succulent in their own way. I would have a hard time picking one out. But I don't have to. "Actually, I'd have to say the fried chicken, but I say this with a grain of salt! ", chimes Hebert lifting a stern finger in the air when I asked what his favorite item to cook was. "I like the fried chicken because it's not easy to cook. You have to watch it and make sure the temperature is constantly under control. It requires the most attention and love...and I believe you call that 'soul food'." With the growing population of food trucks happening here in Tucson, the competition is getting fierce. Not that Jonathan has much to worry about because his food is simply incredible and he is basically one of the only real mobile BBQ options in the area. But running a food truck is hard work and he had this to say on what drives him to do it. "It's the challenge," he concedes. "It's the pride of ownership but most importantly it's the ability to give more. The challenge of being a small business owner is to figure out how to be one of the small businesses that can help drive the economy and help provide opportunities to others." Good words from a very good man. Now that he's been in Tucson for a while, and this being the Tucson Homeskillet, I had to know what Jonathan thought about the food culture here in the Old Pueblo. 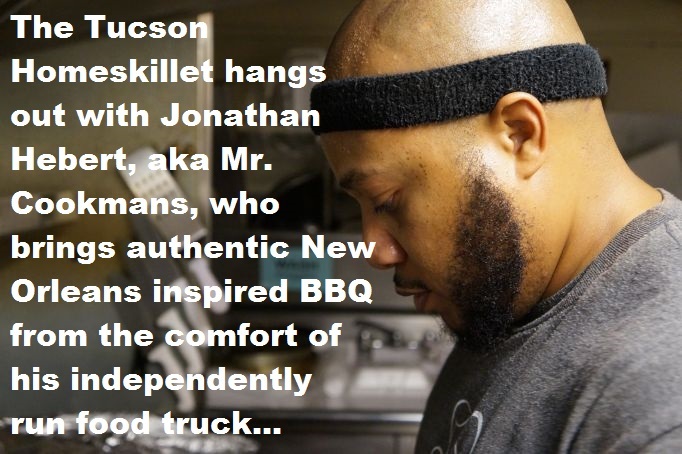 "Believe it or not," he says dishing up a pile of beans, ribs and his seven cheese mac 'n cheese for a patron, "the amount of restaurants here in Tucson is comparable to the amount of restaurants in New Orleans. I seem to find new spots every month or so. You could go somewhere new everyday and get a taste of foods from different cultures. However, I do see some voids in the marketplace and, well, some of which I plan to capitalize on in the future." That hustler spirit will never diminish. Speaking of the future, here's what Jonathan had to say about his upcoming plans, projections and prospects in times to come. "My philosophy on business is a more "down to Earth" approach than anything you can read in a textbook. So it seems only right that I provide my service into those interested in learning business. Overcoming the low points is the only way to grow a business. But I have many repeat customers that swing by the truck then go home to spend time with their families. People are actually creating moments with my food! "And that...is a definite high to me." With that, and me on a meat and food high, all I could do at that point was thank him, thank the Boy Scouts, thank his friends for pulling over and eating mystery grub from some dude in a van and thank his ever present hustler mentality. Jonathan and Mr. Cookman's may have different plans for the future, but as far as the present is concerned, we can all appreciate his gift of BBQ right now. I wish I was within driving distance of this truck!! You made the whole experience sound delicious. I would be visiting him every weekend ! I think this review would be a boost to his business.... as if he needed it. Good job Metal Mark ****!!!!~~~!! !